Eventually, the anti-Nebraska Democrats like Trumbull, John M. Palmer and Norman Judd who had opposed Mr. Lincoln in 1855 would unite behind him in the 1860 presidential contest. Douglas biographer Gerald M. Capers wrote that “many Democratic leaders in the state deserted [Douglas], either because of their own feelings about the Nebraska Act or because they thought he had committed a fatal strategic error in supporting it. When he insisted upon unqualified acceptance of the act as a test of party loyalty, many of his friends bolted or became disaffected: editor ‘Long John’ Wentworth, Lyman Trumbull, John M. Palmer, and even his faithful lieutenant, [John A.] McClernand.”3 The differences between the old line Whigs and Free Soil Democrats continued into patronage choices they suggested for President Lincoln in 1861. While Mr. Lincoln was strengthening many friendships during the 1850s, Douglas was losing some friends and gaining others. The three defecting Democratic State Senators from 1855 all became politically influential in Illinois – Trumbull a three-term Senator; Palmer a Union General, Governor, and Senator; and Judd a Republican State Chairman and Congressman who nearly made it into Mr. Lincoln’s cabinet. Douglas meanwhile placed John Calhoun, a longtime Illinois ally who had once hired Mr. Lincoln as a deputy surveyor, into Kansas territorial politics. At first, Calhoun acted as a moderating influence. But, noted Douglas biographer Capers, “John Calhoun, territorial surveyor-general, through control of the legislature blocked both governors’ efforts towards peace and forced their resignations. Originally an unofficial agent of Douglas instructed to work for a compromise, Calhoun betrayed his chief to promote his own financial interests. He seems to have done so largely by the secret support of the prosouthern clique in Buchanan’s cabinet determined to make Kansas a slave state. To its wishes he yielded, and in turn this clique bent the President at will.”4 Calhoun’s actions contributed to denying Kansas residents a vote on slavery and to Douglas’s break with the Buchanan Administration and thus the weakening of the Senator’s political position in Illinois. But Mr. Lincoln also lost old-line Whig friends, whom the Republican Party in central Illinois desperately needed to attract. So did James H. Matheny, an attorney with whom Mr. Lincoln had also been associated in politics, converted to Know-Nothings. Usher F. Linder also moved to the Douglas side of Illinois politics. So had Mr. Lincoln’s former law partner, John T. Stuart. Even Joseph Gillespie expressed his annoyance with Republican factionalism: “I am tired of being dragooned by some half dozen men who are determined to either rule or ruin. I am out of all temper with, and have no faith in the honesty of, men who insist that ten Whigs shall go with one Democrat because they cannot in conscience vote for a Whig. Though I am well satisfied with Trumbull, yet his five particular friends who would rather see the country go to the Devil than to vote for a Whig are not at all to my taste. 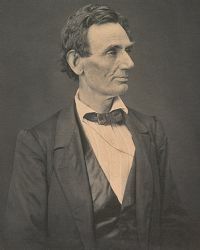 I have made up my mind that henceforth I can be as reckless as they are, and, so help me God, they shall find out that I am one as well as either of them.”6 Only Mr. Lincoln’s 1858 campaign for the Senate brought Gillespie into the Republican Party as a candidate for the legislature. It brought Matheny back as well. Robert W. Johannsen, Stephen A. Douglas, p. 652. Roy P. Basler, editor, The Collected Works of Abraham Lincoln, Volume II, p. 444 (Letter to Elihu Washburne, April 26, 1858). Gerald M. Capers, Stephen A. Douglas Defender of the Union, p. 121. Gerald M. Capers, Stephen A. Douglas Defender of the Union, p. 155. Paul Simon, Lincoln’s Preparation for Greatness: The Illinois Legislative Years, p. 320. Albert J. Beveridge, Abraham Lincoln, 1809-1858, Volume II, p. 383 (Letter from Joseph Gillespie to Mr. Lincoln, June 6, 1856). Rufus Rockwell Wilson, editor, Intimate Memories of Lincoln, p. 192-193 (Thomas J. Pickett, Lincoln Nebraska Daily State Journal, April 12, 1881). Albert J. Beveridge, Abraham Lincoln, 1809-1858, Volume II, p. 397. Albert J. Beveridge, Abraham Lincoln, 1809-1858, Volume II, p. 435-437.